Fishing in New Zealand had small-scale beginnings. But nets and lines cast from handmade boats were replaced by large, mechanised ships, and fishing became an important export industry. The industry must strike a balance between commercial success and ecological interests – there are not always plenty of fish in the sea. Māori were the first in New Zealand to catch fish and gather shellfish for food. Many British settlers who arrived in the mid-1800s preferred to farm animals for meat rather than eat fish. But others such as the Italians and Shetlanders brought their fishing traditions with them. 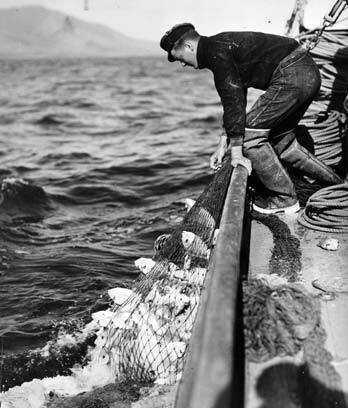 Until about the 1930s they fished with nets or lines cast from small boats. When refrigeration was invented in the late 1800s, fish could be frozen and shipped overseas, or sent long distances to market. In fishmongers’ shops, the fish was displayed and kept fresh on beds of ice. Crayfish (rock lobster) became an important catch in the 1950s, and in the 1960s large quantities were shipped to countries such as the United States. This success encouraged New Zealand to export other types of fish. They were coastal species such as tarakihi and snapper. When coastal waters began to be overfished and fish numbers dropped, the industry had to look elsewhere. When the Exclusive Economic Zone was established in 1978, giving New Zealand the rights to fish up to 200 nautical miles out to sea, the industry began fishing in deeper waters. With the discovery of orange roughy and hoki, the fishing industry boomed in the 1980s and 1990s. Since the 1980s the industry has been carefully managed. It is important that stocks of fish do not dwindle – the survival of the species may be threatened and the industry will also suffer. The total amount of fish caught is restricted through quotas, which allocate how much fish people or companies are allowed to catch.